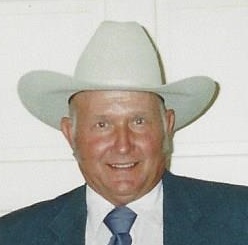 Boyd ~ L. W. “Hoss” Gilbert, 80, a retired metal worker, went to be with our Lord Wednesday, April 3, 2019, in Boyd. Funeral is 10:00 a.m. Saturday, April 6, 2019, at Church of Christ in Boyd with burial in Boyd Cemetery. Family will receive friends 6-8 p.m. Friday at Boyd Church of Christ. Bro. Mark Taylor will officiate. Pallbearers include Ryan Cobb, Charlie Hanks, Randy Gilbert, Tim Gilbert, Ronnie Gilbert, and Larry Davis. Honorary pallbearer is Heath Gilbert. Hoss was born on October 6, 1938, to Van Vleet and Myrtle Ardell (McCraw) Gilbert in Adger, Alabama. He moved to Texas in 1958 and lived with one of his brothers and his wife and family. Hoss was united in marriage to Patricia “Deanna” Pelton on December 16, 1961, and had their son Heath in June 1967. Hoss worked for Miley Trailer and then in 1961 went to work for Norton Metal. He managed their manufacturing for 19 years. Then he opened Gilbert Metal Works with his brother Ray. In the meantime, he raised cattle, pigs and horses and cut and baled hay for friends and neighbors. Hoss also had an arena where cutters, ropers, team pinners and barrel racers rode and competed. Hoss loved fishing, hunting, and water skiing. He furnished bulls for the high school rodeos for their bull riders. Hoss loved being active and involved with others. Horses and bird dogs were a large part of his life. Hoss had a brilliant mind an could build anything. He designed and built logging oil bodies, cattle feeders, as well as government requested projects that no one else could build. He was a member of the NRA, TRA, SWTPA, NCHA and AQHA. He was preceded in death by his parents; his brothers, James, Gearld, and Earl; and his sister, Eva. Those left behind to cherish his memory are his wife of 57 years, Deanna Gilbert of Boyd; his son, Heath Gilbert and wife Evie of Boyd; his grandchildren, Ryan Cobb, Tia King, Holly Gilbert and Charlie Hanks; his 4 great-grandchildren, Byson, Michael, Sophia, and Evelyn; his brother, Ray Gilbert and wife Beverly of Boyd; his sister-in-law, Deloris Decker Gilbert of Newark; numerous nieces, nephews, cousins, and a host of friends.